Another E3 has come and gone, leaving a vast expanse of starry-eyed gamers in its wake. The next wave of high powered gaming consoles will soon be upon us, ushering in a new era exciting, high-definition joy. 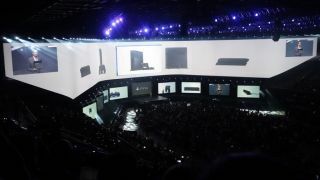 Between the two new consoles previewed at E3 2013, Sony's PlayStation 4 enjoyed the most positive response from the crowd. Sony's press conference seemed tailored to target Microsoft's policies of requiring internet access and clamping down on used game sales with its Xbox One. Sony came out swinging with all its systems. It opened its press conference with the PS Vita, moved to exciting titles for the PS3, then unveiled the PS4. Of the two competitors, Sony came away from E3 looking the best. While Microsoft showed plenty of exciting titles for its Xbox One, attendees rejoiced at Sony's promise of keeping used games around and not demanding an internet connection for its system. We've collected our top five moments for Sony at E3 2013. Read them over and give us your opinion in the comments below. If Sony's no online check-in, used games are OK policy was a black eye for the Xbox One, then the PS4's price tag was the "sweep the leg" move that took Microsoft to the mat. Seeing the Sony system priced a whole hundred dollars cheaper than the competition was a massive surprise for the E3 crowd. If Sony wanted to guarantee strong sales right out of the gate then there couldn't be a better plan. Surely it must owe some of its ability to lowball Microsoft to selling the PS Eye camera separately. Unlike the Xbox One Kinect, it's not an essential part of the system. Therefore it can let consumers choose whether they want to pick one up. That does splinter things a bit for developers, since there's no guarantee a PS4 player will have one, meaning there could be less integrated features for it. Still, we hardly think that matters, we rarely heard a kind word about the Kinect for Xbox 360 or the PS Move anyway. Sony has been having a field day with all the complicated restrictions and PR gaffs from the Xbox One. Just when we thought the Microsoft flub-o-rama had been drowned out by a sea of great looking Xbox exclusives, President of the Interactive Entertainment Business Don Mattrick did a little interview with GameTrailers. Regarding gamers whose internet connections aren't reliable enough for the Xbox One's online requirements, Mattrick had an answer. "Fortunately, we have a product for people who can't get some form of connectivity, and it's called Xbox 360," Mattrick added. "If you have zero access to the internet, that is an offline device." It's hard not to consider Mattrick's response just a tad bit insensitive and sarcastic, especially since many of those people are those living outside of the U.S. and U.K., or soldiers stationed abroad. Once again, Microsoft's fail was Sony's win, and the PS4 came off as a hero without even having to lift a finger. It's beginning to feel like a good cop, bad cop cliche. Ask a gamer about their favorite controller, and you'll probably hear about the Xbox 360's more often than not. That could change in this next generation though, as Sony's redesigned DualShock controller was one of the best we've ever used. Dubbed the DualShock 4, it has the classic look Sony has been sporting since the PlayStation 2 days. The most noticeable difference is the big touchpad you'll find slapped above the sticks. We don't play any games that did anything too revolutionary with this piece of touch interface, but it's nice that the tech is there for developers to tool with. It may look like a classic DualShock, but the feel of the controller has been vastly improved. Its more ergonomically curved, which makes for a more natural, comfortable grip. The tops of thumbsticks have been dimpled, making them easier to pilot with precision. The DualShock 4 is excellent so far, but it's no shoo-in for the best gamepad of the next generation. The Xbox One has an excellent controller, with triggers that give jolting force feedback. All in all, it's nice to see the essential gaming peripheral improved without needlessly reinventing the wheel *ahem* PlayStation 3 boomerang controller. Sleek new systems are all well and good, but they're not much fun without something play on them. New intellectual properties and potential franchise starters are key to launching a platform, especially if they're not available on your competitors platform. Sony didn't have a ton of exclusives to show at its press conference, but it did have one that looked especially intriguing. It's The Order: 1866, a steampunk-ish vision of Victorian era London full of airships and big old guns. Its E3 trailer opened with somber music, the logo for the much-loved Santa Monica Studios and quote from the classic Arthurian novel Le Morte d'Arthur. The game wasn't playable on the E3 show floor, so it could be a ways off, but the trailer's spooky tone and revisionist historical fiction had us intrigued. Sony sure took its sweet time showing the PS4. It had an event months ago where it announced the systems existence, showed some of the new titles it'll be powering, then waved goodbye and switched off the lights without actually showing the system. Why would Sony do that, subjecting itself to considerable ribbing when its PS4 event didn't have an actual PS4 present? The answer is simple: it was saving the surprise of the system's asymmetrical design for E3. And it got plenty of press out of teasing gamers; remember that blink and you'll miss video it put out? Sony piqued curiosity by keeping something behind the curtain, then made good with a striking design that was at once new and classic PlayStation material. It kept gamers guessing, and when it came time to put up or shut up, Sony delivered.